An Adventure of Another Sort — with Confetti! Note: In order to combine two of the author’s blogs, this post has been relocated from another site. For those of you who have already viewed this post, my apologies for the repetition, and thank you for your patience. Original post date: January 16, 2015. Most of my friends and acquaintances know that I ran away with an Italian circus in my twenties, and some know that I have been writing stories about those years for some time. A few know that my memoir, Love in the Elephant Tent, will be published in May of this year. But not many know quite what has gone into that process. I began to compile stories from my under-the-big-top adventures in 1994, a few years after I returned to the US from Italy. It was slow going. I mean slow. Perhaps that’s to be expected when you run off with the Grateful Dead and then a circus in lieu of college. By the time I helped form a local writers critique group in 1998, I had but a handful of chapters completed, none of which would make it into the final book. Over the next five years, I worked my way through the remaining story — laughter and tears, joy and frustration, and an incredibly patient writers group were regular and indispensable companions. By late 2003, I held a completed first draft in my hands — all 135,000 words of it. Another 5 years would pass as I hacked away at revisions and shepherded some 40,000 words, hundreds of hours of work, into the recycling bin. In 2009, it was time to find an agent, and I did. Then it time was to find a publisher. And that came too, but that’s another story, another post. For now I’ll just say that it took another 6 years. In spring of 2014, I had a contract and a publishing date set for May, 2015. A publishing date. A specific point in time when others — anyone — could peer into my heart simply by opening a book. Oh dear. The reality of sending such personal stories of a crazy and tumultuous period of my life out into the world makes me catch my breath — especially after hanging onto them for 20-plus years. But I do have to let go, see if this book will find its way into readers’ hands and hearts and bookshelves. So many concerns: Will anyone connect with my story? See themselves and their experiences in my own? Did I represent my feelings accurately? Treat others fairly? Spell foreign words correctly? And what about those damn commas? I received my Advance Reading Copy in late December. I pored over it and adorned it with so many sticky notes that it looked like a 1920s flapper dress. And then I went back and pondered my notes, one by one. Fixing and unfixing passages. Moving commas. Correcting those foreign words. Checking accents, dates, and weights. 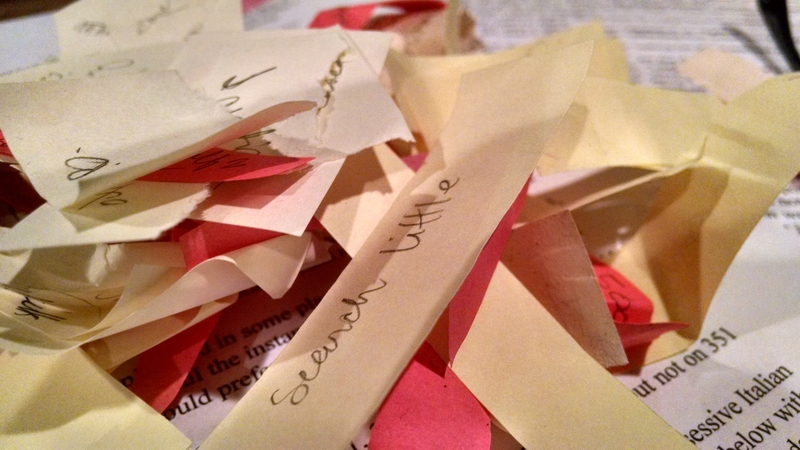 And then I unstuck those sticky notes, piled them up in a corner of my desk. They reminded me of confetti. And it is time to celebrate. The book may not be perfect, but that’s okay. I’m not perfect either, but I seem to be making my way through this world nonetheless. Not everybody “gets” me, so I won’t expect everyone to “get” my book. But some will, and I will be thankful for that. It’s time for me to let go. Fare thee well, my friend. Hooray for you and your epic bravery! Joining an Italian circus is one thing, but writing a book about those exploits is something else entirely. Good on you!